THE INTER VARSITY MUD-LARK. CAMBRIDGE WIN ANNUAL RELIABILITY TRIAL OVER SEVERE ROUTE. 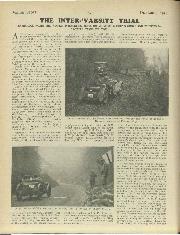 Marlow, whence the cars were dispatched on their 56 mile journey to Tying, presented a busy scene. All sorts and conditions of cars were entered by their enthusiastic owners, ranging from 0. Henri's 1922 3 litre Bentley to G. J. W. Moncrieff's 1933 J2 Midget. C. W. C. Gough turned up with a Morris Minor chassis, which the day before had been a saloon, and would be again after the Trial. 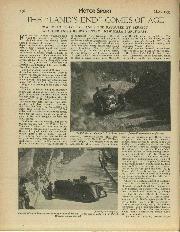 On the entry sheet some of the cars were given additional descriptions, notably the " Alpine " M.G. Midget and the " Targa Florio Replica" Itala (which was reputed to have been purchased by its owner for £4 from a scrap heap). Incidentally, the luckless individual responsible for this entry sheet has not yet learned that Hornets are Wolseleys, not 4' Wolseys." Vauxhall, but failed half way, where his back wheels dropped into the ditch. Unluckily the car came to rest against a tough sapling, which required to be moved before the car could regain the road. The sapling proved to be extraordinarily flexible, and resisted the prolonged efforts of driver, passengers and onlookers to snap its trunk. When this wrestling match had been in progress for some time, the marshal at this point, who had observed the uneven contest the whole time, remarked that he had an axe in his car. . . . Right at the end " Pige " appeared on the scene and climbed slowly, yet without a waver of hesitation, on his veteran A.C., thereby securing the distinction of being the only man to climb both Alms and Crowell. 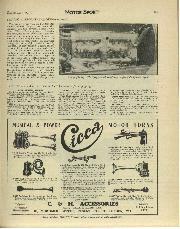 The sight must have been full of chagrin to many owners of snappy 1933 sports models. Kimble Lane was in a particularly beastly state, the grey mud being a foot deep in parts. Two old Amilcars and a Riley failed, but for the rest it seemed rather a pointless way of getting one's car unnecessarily muddy. Right at the end two extra deep puddles caused driver and passenger of small two seaters to leap into the air simultaneously, which looked rather amusing, for no sooner had they recovered from the first throw than the second was upon them. on. a cup-full of oil ! H.N. 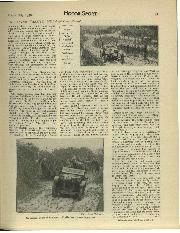 (Results continued on page 89). Cambridge, 56.8; Oxford, 30.6 (figure of merit). 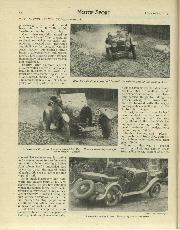 Best Performance : Tie between A. C. Fairtlough (Salmson C.) and J. G. Pige-Leschallns (2-litre A.C. C.). Veterans' Cup : J. G. Pige-Leschallas (A.C.). May Cup (best undergraduate) : A. C. Fairtlough (Salmson C.). Falkner Cup (best 850 c.c. 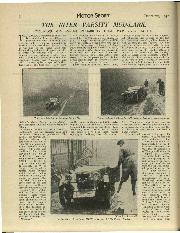 car) : T. A. W. Thorpe (M.G. Midget C.). Fairtlough Cap (best 1,500 c.c. car) : A. C. Fairtlough (Salmson C.). Maw Cup (best unlimited c.c. car) : 0. H. J. Bertram (30-98 Vauxhall C.). E. C. H. Goossens (Ford), G. J. W. Moncrieff (M.G. Midget), G. B. C. Sumner (Austin S., 0. ), L. ButlerHenderson (Frazer-Nash), R. M. Mere (M.G. Magna 0. ), J. B. Carver (M.G. Midget), B. T. Ails-man (Morris Minor 0. ), 12. E. Tongue (Riley 0. 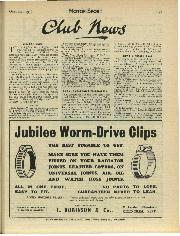 ), R. C.
Vickers (McEvoy Wolseley Hornet Special), C. W. ' Gough (Morris Minor), R. W. Johnston (FrazerNash), E. J. Kehoe (Morris Minor). Second Class Awards: 3. H. Baldwin (Bentley), R. C. Porter (Riley), R. Bickford (Lancia), A. T. Gamble (Riley), H. Leith Ross (Hillman 0. ), A. E. Scroggs (Trojan 0.). 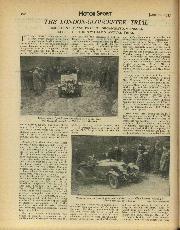 No Award : G. H. C. Jones (Amilcar), T. A. Frazer (Amilcar), R. A. Beaver (Alvis), R. B. Watson (Bugatti), N. A. Watkins (Frazer-Nash 0.) — Brookhouse (Aniilcar 0.). *All drivers " Cambridge " except where " Oxford " is indicated by "0." H. Leith Ross (Hillman 0.) A. E.
R. B. Watson (Bugatti) N. A.